"I used to remember my brother Henry walking into a fire outdoors when he was a week old. It was remarkable in me to remember a thing like that and it was still more remarkable that I should cling to the delusion for thirty years that I did remember it -- for of course it never happened; he would not have been able to walk at that age. . . . For many years I remembered helping my grandfather drinking his whiskey when I was six weeks old but I do not tell about that any more now; I am grown old and my memory is not as active as it used to be. When I was younger I could remember anything, whether it had happened or not; but my faculties are decaying now and soon I shall be so I cannot remember any but the things that never happened." 1. Ben Yagoda, Memoir, A History (2009), called my attention to it. The passage is from The Autobiography of Mark Twain, ed. Charles Neider (New York: Harper Collins, 1990), p. 4. I read it on Google Books, but I want the physical thing for Christmas. BookNinja has a reference to an interesting article on why buying an electronic book reader is a bad idea—at least at this time. Remember Eight Track? I came across the Lo-Fi Manifesto by following a link from Douglas Barone, to whose review of DEVONthink I referred in yesterday's post. He himself seems to have implemented himself a "low-fi" or simple approach with his File System Manger that relies on a text editor, text files and consistent file naming. Despite their humble, decades-old base technology (plain text), innovative uses of lo-fi technologies can be remarkably hi-fi, as in the case of AJAX (whose most famous application may be Google’s Gmail service)." I think this approach is "commendable" and "ingenious," even though it is more trouble than it is worth. What you really want for a complicated (or life-long) data-store is a database. What you also want is easy import and export capabilities that reliably allow you to transform your content into plain text files, HTML or whatever you desire. You should not always have to work with these simple formats and their inherent limitations. The only applications you should definitely avoid are those that "lock you in" or make it difficult to export to plain text. To use text files in the way described by adherents of this method seems to me the equivalent of mowing a five acre meadow with a Push Reel Mower. Heroic ... perhaps, but not the smartest use of effort and time. Textweb is an application styled as a "hypertext notepad for windows." The manual compares it with an HTML editor only to point out that "unlike HTML editors, Textweb does not focus on the presentation of linked information. Textweb focuses on the editing of linked information as a way to facilitate verbal thinking about complex ideas and systems." It is "intended to help record and think about complex networks of ideas, things, or people, and their interactions. It is particularly helpful for those who frequently must enter new conceptual territory, and make sense of what they find there." In other words, it a tool that allows one to establish and refine connections between ideas. It works like a Wiki. But it has not seen any development in a long time and lacks many of the features that characterizes an up-to-date desktop wiki application like ConnectedText. Therefore it seems to me only of historical interest at this time. 1. See Corral floating facts and thoughts with ConnectedText. Susan Sontag seems to have been an inveterate collector and list maker. This is most clearly revealed in her novel The Volcano Lover, in which one of the nameless characters finds: "I'm checking on what's in the world. What's left. What's discarded. What's no longer cherished. What had to be sacrificed. What someone thought might interest someone else ... there may be something valuable, there. Not valuable, exactly. But something I would want. Want to rescue. Something that speaks to me. To my longings." For her (or her characters), "collecting expresses a free-floating desire that attaches and re-attaches itself—it is a succession of desires. The true collector is not in the grip of what is collected but of collecting." And collecting leads to making lists: One wants to know what one has: "collecting is a species of insatiable desire ... there [is] ... a ledger somewhere ... But lists are a much more spiritual enterprise for the athlete of material and mental acquisitiveness. The list is itself a collection, a sublimated collection. What the world has in it. This account seems to be closer to the truth than Umberto Eco's musings—at least as far as I am concerned. Both views seem to be influenced by Roland Barthes, another lover of lists (in my collection). 1. See Umberto Eco on Lists. Umberto Eco claims in an interview in Der Spiegel that "the list is the origin of culture. It's part of the history of art and literature." And: "We also have completely practical lists -- the shopping list, the will, the menu -- that are also cultural achievements in their own right." While we might think "that a list is primitive and typical of very early cultures, which had no exact concept of the universe and were therefore limited to listing the characteristics they could name. But, in cultural history, the list has prevailed over and over again. It is by no means merely an expression of primitive cultures." This must be true, even though it is not very interesting. Making a list is often an end in itself. And sometimes it is the beginning of serious engagement with what we take care to list. Among other things, lists are primitive outlines. Eco has more "interesting" things to say, however: People have never stopped "describing the sky, simply listing what they see. Lovers are in the same position. They experience a deficiency of language, a lack of words to express their feelings. But do lovers ever stop trying to do so? They create lists: Your eyes are so beautiful, and so is your mouth, and your collarbone ... One could go into great detail." And: "we like all the things that we assume have no limits and, therefore, no end. It's a way of escaping thoughts about death. We like lists because we don't want to die." This must be false, even though it is very interesting—not because of what it reveals about lists, but about Eco himself. Lists qua lists have as little to do with falling in love as they have to do with our fear of dying. The first and last things we list are likely things. They may be things we love, but they may also be things we need or want to avoid. Listing things is a formal way of taking note of things we want to remember, it is not primarily a device for making love or escaping what is inevitable. None of this means, of course, that we cannot, like Eco, (ab)use lists in this or many other ways which I do not care to list here. As for my love of lists, I am sure it has nothing to do with not wanting to die. Linked Notes is a Net 2.0 application. It is a basic desktop wiki application with automatic linking of pages and WYSIWYG editing. It has basic outlining capabilities and supports export the export of single pages to txt and rtf. It's pretty slick. On the negative side, its search capability is weak and its feature set rather limited. The search is limited to the page that happens to be open. Linked Notes comes in two versions: one is free (and this is the one I tested); the other one costs 19.95. The paid version allows password protection and encryption, as well as export of all pages to one rtf file (for import into a word processing application). It also allows for a word search of all pages. It's the best of the simple desktop wiki applications I know of. While it is no competition to ConnectedText, it seems much more capable than Zulupad, for instance. At first sight it looks very much like Wikidpad. I would characterize it as "wordpad with wiki links," no more, but certainly also no less. Compared with the application that is making a lot of noise right now in the Outliner Forum right now, it is definitely much more mature and polished. The application is a new single-pane outliner. It is called UVOutliner. While it looks good, it does very little. Multiline Rich Text: Each row in the outline can have multiple lines of a rich text. This means that you can format rows in the outline like in any word processor - you can specify colors, font sizes, etc. Styles allow you to specify how to format rows in certain hierarchies. Automatic styling also helps you format the document uniformly while typing. 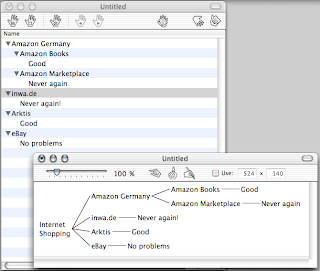 Export: outlines can be exported to plain text or HTML. I prefer the ConnectedText Outliner—and I do so not just because all my work is deeply connected with this application. I would also prefer TkOutline over this new application, which is really rudimentary, that is, very limited. Yet it requires a framework that when loaded uses more 100 megabytes of memory all by itself. This is a screenshot of an older version that I tried when I had an iBook. What I like is that the outline produces a simple diagram. Simple is good sometimes. I have referred to this before. It is advertised as a notepad on crack. The application is not as bad as the description, but neither is it as good as some other personal or desktop wikis, which are available for Windows. Do I need to say that Zulupad is a pale imitation of Voodoopad, a Mac application? The advertisement says "Zulupad is now available in two flavors: The original ZuluPad is opensource under the GPL, and ZuluPad Pro can be purchased for $15." I am not sure whether this means that the one contains less crack because I don't know whether crack has any flavor. Still, I would stay away from it, no matter what its flavor may be. "Just click on any word in any Windows application and the WikiPedia article will be opened in a small window." WikiReader, a Windows application, caches articles "for quick and easy access; articles can even be read when the computer is not connected to the Internet." I have just as little use for this software application as I have for the hardware called WikiReader, but perhaps some others dp.